Here is a look at the players advancing to Day 2 from Flight E of the $400 No-Limit Hold'em Re-Entry Multi-Flight event. These 34 players will return to play Day 2 on Wednesday March 21st at 11:00 am. The final flight of Event #14 is just back from their first break of the day, and there are currently 170 entries, and climbing. Registration is open until the start of Level 9 for the final flight, so anyone wishing to enter/re-enter has until approx. 8:30 pm to do so. Flight E is bagging up their chips right now, and the list of advancing players from their flight will be posted within the hour. Here is a look at the players advancing to Day 2 from Flight D of the $400 No-Limit Hold'em Re-Entry Multi-Flight event. These 23 players will return to play Day 2 on Wednesday March 21st at 11:00 am. Here is a look at the players advancing to Day 2 from Flight C of the $400 No-Limit Hold'em Re-Entry Multi-Flight event. These 26 players will return to play Day 2 on Wednesday March 21st at 11:00 am. Here is a look at the players advancing to Day 2 from Flight B of the $400 No-Limit Hold'em Re-Entry Multi-Flight event. These 20 players will return to play Day 2 on Wednesday March 21st at 11:00 am. Here is a look at the players advancing to Day 2 from Flight A of the $400 No-Limit Hold'em Re-Entry Multi-Flight event. These 26 players will return to play Day 2 on Wednesday March 21st at 11:00 am. 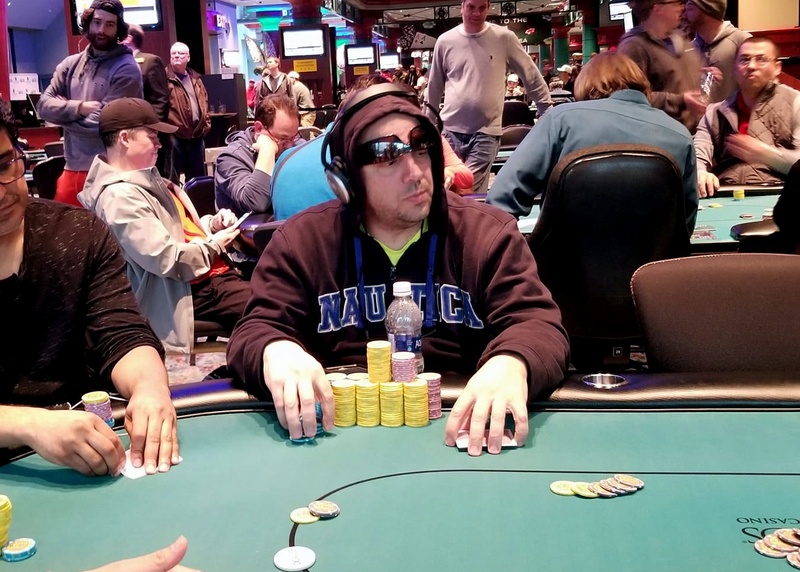 There were a total of 179 entries in the fifth flight of the $400 No-Limit Hold'em Re-Entry Event #14. The field will play 15 full levels before bagging and tagging later this evening. Anyone that bags in Flight W will join the 27 advancing from Flight A, the 20 from Flight B, the 25 from Flight C, the 23 from Flight D, and any from tonight's Flight F, and will return to play Day 2 on Wednesday March 21st at 11 am. This is a best stack forward event, so it's possible that players will bag chips in more than one flight, and carry only their largest stack forward to Day 2. At the conclusion of the final flight tonight, we will post a list of all advancing players, along with seat assignments. Players have just returned from a 15-minute break, and registration for the second to last flight is now closed. The official numbers will be posted as soon as they are announced, but right now the clock says 164 entries. This is a best stack forward tournament. If you bag chips more than once, you will play only your best stack forward to Day 2. Day 2 Levels will be 40-minutes each. Day 2 Levels 16+ will be 40-minutes each.